Trending in 2017 for home design and décor is the Modern Farmhouse style. Words like “shiplap” and “farmhouse sink” are almost as common today as “please” and “thank you.” And while most would never put the words “modern” and “farmhouse” together, this style breaks the mold. The Modern Farmhouse style is achieved when sophistication meets simplicity, where old and new elements combine comfort and style and bring vintage and modern elements along for the ride, with a healthy amount of contrasting styles. And while there are common elements in this style, they are used in many different combinations to create unique, individual looks. G&G Custom Homes recently finished a modern farmhouse home that catches the eye. To achieve the Modern Farmhouse look on both the interior and the exterior, Garcia recommends maintaining neutral paint colors, grey, black and white, then layering in natural wood, like a combination of salvaged wood with authentic wear and tear. 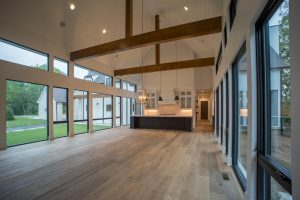 With this featured modern farmhouse, G&G Custom Homes has mixed woods and metals, such as board and batten, a vertical tile, a high gloss black metal roof over the main section of the house and complimented it all with a brick wall and a partial pergola. Other elements in this style include vaulted ceilings with massive wood beams and the warmth of a large fireplace to anchor the room. In the kitchen, the classic farmhouse sink and combination of neutral white and gray elements are offset by the industrial, steel kitchen appliances. A major feature of this home is the large windows, which reach to the floor allowing natural light that provide color and texture to anchor the space with the outdoor elements of nature. Unique to the modern farmhouse home depicted is the master suite, which offer two entrances separated by pocket doors for a private getaway. The Modern Farmhouse style offers endless possibilities for a unique combination of traditional, whimsical or contemporary styles to create your custom home. The key to achieving this look begins with a trusted home builder that has experience designing this style of home. For more information, contact Joe Garcia and G&G Custom Homes at 317-418-7665 to schedule your consultation today.